» Varicose Vein Treatment in Utah: Surgery, Laser, or Heat Treatment? Varicose Vein Treatment in Utah: Surgery, Laser, or Heat Treatment? People who have varicose veins need to undergo certain treatments. 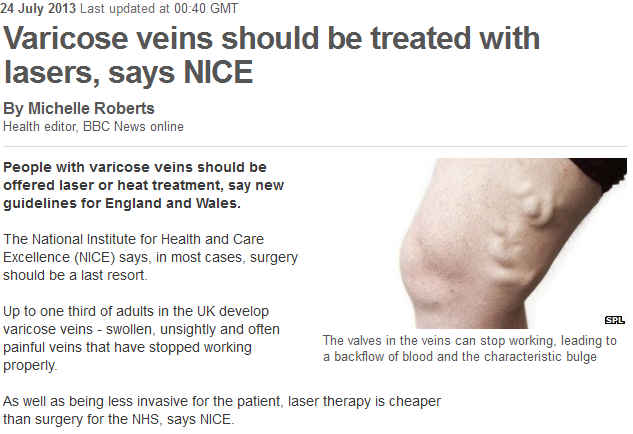 In an article by BBC News health editor Michelle Roberts, Britain’s National Institute for Health and Care Excellence (NICE) stated that non-invasive solutions for varicose veins will ease the strain on the National Health Service’s resources on surgery. Surgery is often touted as the first option to treat varicose veins even though less complicated procedures like laser and heat treatments are available. Varicose veins, also known as spider veins, are also a concern for residents of Utah. Residents experience health problems related to sedentary lifestyles and obesity, particularly among the middle-aged and teenagers. These worrying conditions can lead to health issues like varicose veins, which will require effective vein treatment in Utah. Conditions like varicose veins are also potential triggers for deep vein thrombosis, which in turn may trigger pulmonary embolisms in people above 50. When you need to have these unsightly veins treated, but cannot afford to break the bank for the more complicated procedures, you can seek comprehensive vein treatment from dermatologists like Dr. Richard Stone, M.D of Stone Dermatology. People suffering from varicose veins experience a host of unpleasant symptoms, such as swollen ankles, restless legs syndrome, and odd patches around the legs and ankles. A licensed and experienced dermatologist can evaluate the extent of the problem and plan the appropriate treatment solutions. On the other hand, should patients suffering from varicose veins seek surgical treatment, or should they go for laser or heat treatments instead? Health experts say that vein surgery should be a last resort when treating varicose veins. Traditional vein surgery takes at least an-hour-and-a-half, and the patient will be sedated during the procedure. On the other hand, those undergoing non-invasive procedures, like heat and laser treatments, remain awake throughout the operation, which doesn’t last more than 60 minutes. Centers for varicose vein treatment in Provo, like Stone Dermatology, have the resources and know-how to conduct non-invasive treatments such as laser and heat therapy. Dermatologists will also recommend other treatments that will ease the pain, such as donning compression stockings. The medical-grade models range from Class I (20-30mmHg) to Class III (40-50mmHg). To ease discomfort, sufferers are advised to avoid standing and sitting down for long periods of time. Varicose veins may lead to the development of other ailments, like leg ulcers or cardiovascular problems. Preventing these diseases will require assistance from a vein treatment expert who can map out the proper treatment options.